Great weigh-in pic – right? Jean Pascal vs. Bernard Hopkins. Notice anything about these guys’ shoulders? Especially Jean Pascal’s? You should. They exhibit a perfect example of what I’ve come to call “Boxer’s shoulder”. It’s the condition where either striking or the constant push-and-pull in Jiu-Jitsu causes your pectorals and the muscles in the front of your shoulders to become too tight for your back muscles. The result: a rounded back with shoulders that slope forward. And that oh-not-so-nice pain in between the shoulder blades because your Rhomboids are too weak to hold you in the proper position. If you don’t yet look like Jean Pascal, you want to try a dose of prevention. 1) If you’re striking a lot with your arms or doing a lot of Jiu-Jitsu, cut other “Pec” exercises like push-ups from your workout. You need to work on balancing your body. If you’re already over-exerting your pecs and the front of your body, take any additional time to do back exercises (like back extensions or reverse push-ups on the bench-press bar). 2) Stretch your pecs ! As muscles become stronger, they shorten. This is why boxers’ shoulders are out of alignment: their pecs are too short. You fix this by strengthening your back muscles, but also by loosening your front. 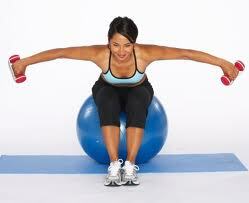 A regular pec stretch on the floor or the wall should be done at the end of each workout. If you’ve already become misaligned, you’ll want to follow the above advice, and step it up a notch. Preventing a problem is easier than re-adapting your body once it’s already gone out of whack. or the Dolphin pose in Yoga. The stretches to do are essentially those I mentioned earlier plus any other pec or front-of-shoulder stretches you might know. You really want to integrate these stretches and exercises after every work-out if you find your shoulders are already slumped inwards. You can also try to concentrate – during the day – to keep your thumbs pointing forwards when you stand. People with boxer’s shoulder tend to have the tops of their hands pointing forward when they stand. You want to rotate your hand so that the thumb points forward instead. This will force your shoulder into its correct position. I was talking to one of my teammates the other day about the meaning of the word “Dojo”, and by extension what it means to go to the place where we learn our art. According to my teammate, a “Dojo” is “the place where we kill our Ego”. I thought this was a pretty cool ancient sound-bite because it encapsulates an important aspect of learning a martial art. No matter how confident or self-assured you are when you walk into the gym, it’s simply a matter of time before something humbling takes you down a notch. Whether you’re an instructor and a student asks you a question you don’t know how to answer or a beginner who is constantly physically humbled by the others in the school, Ego-destroying experiences are a vital aspect of being a martial artist. After all, the Ego-killing aspect is one of the beautiful things about learning a martial art. Knowing how to defend yourself may build confidence, but lest that feeling grows into pride, your teammates are there to bring you back to earth with a submission or a tough sparring session in the ring. This is, of course, a bit of a paradox: training builds confidence but destroys Ego. That being said, my teammate’s definition got me wondering. What is the ‘real’ definition of Dojo? And does this offer any insight into what it means to be a martial artist? A dojo is a space of commitment in which people practice together. What is powerful about the dojo is what it tells us of learning, and ultimately, of waking up, of being alive. In Japanese, “dojo” refers to the place where we train “in the way”. This points to two important distinctions. The first is that the dojo is a place of learning where one practices what is being taught. This is different from the conventional classroom where students sit passively taking notes or listening to a lecture. This is not to say authentic enquiry is unavailable in lecture halls, but it points to the difference between academic knowledge and an embodied knowledge that allows people to take actions that sustain and enhance their lives. In a place of learning like the dojo students practice what is being taught and over time begin to embody the subject matter. It lives in the body, it is who they are. The second distinction revolves around the concept of “Do”, which translates as “Way”. The origin of the word “dojo” comes from the Sanskrit bodhimanda, which means the place of awakening. The Japanese kanji for Do is composed of two parts. One depicts a man walking on a road. The other is the human throat, which surrounds the jugular vein, representing the very core and pulse of our life. A man walking toward life. The Way is a theme of life. The dojo is a place where we awaken our body, grow the self, and unite with the spirit through rigorous and compassionate life-enquiry. Okay – so it looks like my teammate wasn’t totally right. But to my mind, there’s something very meaningful in what Strozzi-Heckler says. It reminds me of something a teacher of mine once said. We participate in our art but do not own it. If we train and teach well, others may also follow this way too. https://terrieschauer.com/wp-content/uploads/2018/05/dojo.jpg 1200 1600 Terrie Schauer https://terrieschauer.com/wp-content/uploads/2018/03/TerrieSchauer_Logo_RGB_Stacked-1030x525.png Terrie Schauer2018-05-04 20:24:462018-05-22 15:13:26WHAT IS THE MEANING OF "DOJO"
What does being a “warrior” mean to you? Do you have a specific image of yourself as a fighter or as a person? My personal vision of a warrior is a person, man or female, who does what it takes to conquer. I don’t have a specific image of myself. How has the mindset you developed in fighting made it easier for you to exceed your limits in the rest of your life? It has made me more confident about me. Therefore it seems when facing a ‘limit’ now I approach it as a challenge. Same with every fight. Instead of being insecure I now immediately think of ways to resolve the issue cause I am confident I am strong enough to overcome the problem. I started training in kickboxing when I was quite young. That was my sport – I like to train kick-boxing. I’m not a street fighter or anything like that. I fight only in the gym and in the ring. When I fight I’m like another person – I’m a different Jorina than when I’m at home. Some people think that I’m joking when I say that I’m a kickboxer. The sport makes me more relaxed outside the gym. When I’m out with my friends and someone wants to fight me, I just say: “Come tomorrow to the gym.” When they don’t show up, I know they’re losers! What have you learned through fighting that has helped you become more effective, balanced or happy in your life? I give everything in training. When I’m angry, I punch the bag very hard. I punch so hard that all the aggression is out! Check out one of Jorina’s Fights!! Where does your motivation for fighting come from? What makes you want to fight and train? I fight because of the mental and physical challenges it presents. There is nothing like getting in a ring and pushing yourself to your mental and physical limits. The training is even tougher. I do it because I love muay thai and fighting is largely about bringing honour to the camp by going good muay thai. A warrior is a person with a strong heart. In Thai they call it Gamlang jai. Warriors are people who will not let themselves be defeated regardless of the outcome in the ring. They fight until they can’t. And then they keep fighting. I’m a fighter who tries (though I’m not always successful) to enjoy myself in the ring. People frequently comment on how much I’m smiling before and even during the fight. It’s a real privilege to fight and I always try to keep that in mind. I get very anxious about fighting. I’m never afraid of getting hurt, but I get nervous that I won’t fight up to my potential. My anxiety will get so bad that I think of backing out. I come up with elaborate plans to leave the country or find other ways to get out of fighting. However, in my five years of fighting, I have never backed out of a fight. Knowing that quitting is not an option forces me to continue despite nearly disabling fear of failure. Very few other experiences compare to the challenge of fighting. I try to keep that in mind when I face difficult situations. Fighting has taught me to focus on one thing and excel at it. I’ve always been a person with diverse interests who likes to stay busy. At one point I was volunteering, doing prisoner activism, working a few jobs, going to school and training muay thai. I loved everything I was doing, but couldn’t put my full effort into any one thing. With fighting, you have to dedicate yourself 100% or you just shouldn’t do it. I figured out that I would rather simplify my life and focus on the few things that matter than spread myself too thin. We need more women to get involved so that the sport can grow. Most of the female fighters I know have a lot of trouble finding fights because there are so few of us out there. Fighting is not for everyone, but you won’t know if you’re a fighter until you train and actually get into the ring. 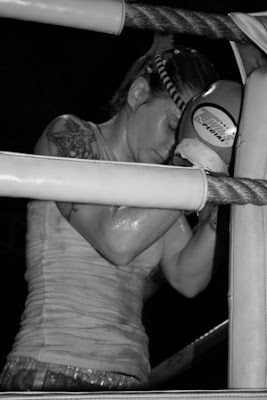 The most female fighter I know got into the sport for fitness, fell in love and realized that they were fighters. Being a “warrior” means pushing myself to the limits. Be the best I can be, inside and outside of the ring. Fighting has made me a stronger person physically but especially mentally. To be a warrior means to persevere and to never give up. Give your all and you’ll come out on top. There are always obstacles getting in the way, mountains to climb and rivers to cross. But through fighting, I’ve learned what an amazing tool the mind can be. With a strong mind and a big heart, your body will over come these obstacles. I never set out to be a fighter and I’m sure no one in my family expected it either. I was always the smallest in my class, always the quiet one trying to stay out of people’s way. I started doing muay thai for the physical benefits. I loved the workout and the way my body was responding to the hard work. I showed up at the gym one day and my trainer told me he’d gotten me a fight. I’m not a quitter so I accepted. I lost the fight but loved the adrenaline rush that came with it. I knew I could do better and knew I could win. I don’t see myself or my life as anything really amazing. I’m just doing what I love. I guess I’m just really lucky to have the opportunity to be doing it in Thailand! I’m living my dream. At the moment, I’ve pretty much dedicated my life to muay thai. I live in Thailand and fight as often as I physically can. I train twice a day, 6 days a week. It doesn’t leave much time for anything else. I have always been a very dedicated person to what I do, whether it’s work, relationships, or fighting. Right now, work is fighting so it makes it easier to stay focused and dedicate 100% of myself to what I’m doing. Muay thai and fighting has given me confidence in myself and my abilities. It’s shown me that there is so substitute for hard work. I’m not sure that fighting is what has helped me learn how to be more balance and happy in life but more my experience in Thailand. Through living here day in and day out for over 2 years, I’ve learned to appreciate the little things in life. Through training and my interactions with so many people from different walks of life, I’ve learned to be more patient and relaxed. My trainer has helped me see how important it is to forgive. The people of this country have shown me that a smile goes a long way. I’ve also learnt to live for today. I don’t think 2 fights ahead. I think of the one coming up. I live in the present and will deal with the future when it comes. Good boxing technique begins from the ground up. With a heavy bag, a pair of pads or – even worse – a sparring partner in front of you, it’s easy to get carried away and sucked into throwing punches using only your arms. But if you want to build punching power, reduce tiredness and have a good defence, you need to a proper stance: everything else is built on a good starting position. Here’s a checklist that will help you assess the quality of your stance. 1) Find a line on the ground. Now position your feet so that the toe of your front foot touches the line, while the heel of your back foot touches the same line. Your front foot should be facing almost straightforward. 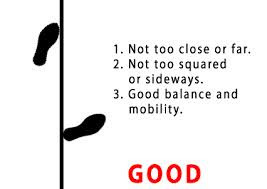 The back foot should point outwards at a 45-degree angle. Now lift your back heel and bend your knees. 2) Beginners and Thai Boxers often stand too upright for boxing (image on the right). If you plan to develop your boxing, you want to make sure that your knees are bent so that the muscles in your legs are activated (image on the left, although the back foot is turned too far out in this picture). Bent knees will give you additional agility in your slips and evasive footwork, and allow you to throw punches with maximum speed and power. 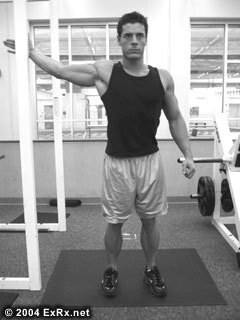 3) Your shoulders should be angled at 45 degrees: standing square makes you a bigger target. Your backhand should be glued to your cheek, while your front hand can sit about a fist’s distance from your jaw. 4) Don’t forget to tuck your chin, and to roll your shoulders slightly inwards. Now all you have to do is consistently move around in, and come back to this position… Practice this in shadow boxing! For a more in-depth video explanation, check out D. Travis YouTube post on the subject. I picked this book up about a month ago because, as a boxing coach, I was getting sick of putting my students through the same conditioning drills at every work-out. I wanted some variety, some new exercises, and some new challenges for my athletes. I did n’t totally expect what I got: the work-out sections were predictable but good. The exercises were described with easy-to-understand pictures. At the end of the book, Hatmaker has various work-out menus that address different muscle groups and types of strength/endurance. These were used and make the book worth the money for coaches and boxers looking to supplement existing training. But the book’s power punch, for me, was the intro. Mark Hatmaker spends a few pages debunking some of the old myths that haunt conventional boxing gyms. In a few efficient pages, he puts the finger on some of the things that have annoyed me for years in the sport. When I was still boxing, my teammates and I used to deride the ‘communist Russian’ approach to boxing that sees many athletes ground down with boring, repetitive work-outs and over-training such as mindless road-work and sets and sets of push-ups. I especially like the author’s take on road-work. As a boxer, I ate many, many, many miles on the tarmac. Most of these miles were at a comfortable pace. They gave me tendonitis, ate lots and lots of time, took lots and lots of energy and brought me away from the gym where I might better spend my time working on technique. Hatmaker’s philosophy on roadwork is that boxers don’t run marathons. As amateurs, boxers train for 3 x 3-minute rounds or perhaps 2 x 4 minutes. Pros fight longer bouts, with 3 x 12 is the longest championship fights. For amateurs, super-intense 9 or 8-minute bouts require explosive power and some endurance, but nothing near the type of endurance that is built by running 5+ miles per day. For boxing, sprints, interval training, hill running, and power-building exercises are best in terms of conditioning. His message: stop wearing out your cartilage running miles and miles. The fast-and-efficient work-out plans offered in the book, if followed, will help save time that can be applied to learning the actual art of boxing. The sprint-and-lift-heavy philosophy also gives a new perspective on the fact that many coaches continue to prescribe rounds and rounds of monotonous and even-paced banging away at heavy bags. Your athletes won’t do marathons of hitting punching bags either. Hatmaker’s book begs the question: why train boxers as if the goal were an epic 40-minute even-paced bout with the bag? He presents his reader with alternatives. I would recommend this book to coaches and boxers looking to develop new training habits. I would highly, highly recommend it for many practitioners who have been in the sport for a while. In the era of Crossfit, its high time for the debunking of some of the Rocky-era ghosts that continue to haunt boxing! 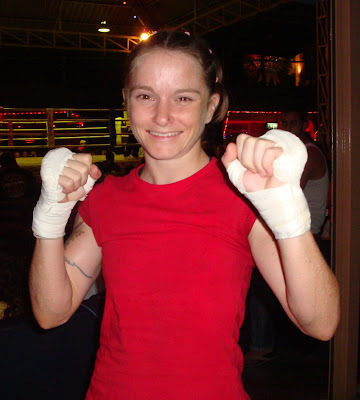 24-year-old Muay Thai fighter Ashley Altman, (6 wins, 7 losses; 2006 WAKO US Lightweight division title; 2007 TBA-SA North American Bantamweight title) is self-promoted. What this means is that she doesn’t rely on a gym or a manager to book fights for her and supervise her training. In the world of kickboxing, Muay Thai and MMA, this is pretty rare. Starting out, unless your coach or gym manager wants to take you on as a project, it can be hard starting out. Then, a bit later, once you have a bit of experience, it’s not always easy to find good match-ups, especially for women. Q. )Why did you choose to self-promote rather than going through a trainer or promoter? After I’d been training for about a year I brought it up with the owner of my gym that I was interested in doing my first fight, he agreed to do so and a few weeks later one was lined up for me. After talking with my opponent’s trainer about who I was getting myself matched up with I learn that she’s had about 20 fights and won several national titles. She also happened to be about 5″ taller. When I bring this up with my gym owner he just tells me I should have no problem with her since most girl fighters, even national champs, aren’t any good anyway. Lucky for me, the opponents get switched and I end up fighting a girl with seemingly no training at all who I put down in under a minute of the first round. The fight was in a run-down theatre with a garden hose for ring ropes and an audience of maybe 20 people, but I wasn’t going to complain as it was my first fight and that’s how you get started. I also found out the day of my fight that I wasn’t going to have a corner because no one could be bothered to take the time out of their schedule, despite the venue only being a 3-hour drive from my gym. It was a rather disappointing victory since the girl basically went down without a fight, so I was eager to get another match and make up for it. Time goes by and there seems to be no interest in getting me another fight, so after a while, I and my girlfriend/training partner decide to take matters into our own hands, start scouring the different kickboxing/female fighting message boards for fight opportunities and getting in contact with promoters around the US. Q: How do you handle training? Do you have a coach that follows you? Who’s your corner person? For a while, the place I trained at didn’t have much in the way of kickboxing instruction going on. I started off doing a fairly basic muay thai class and training with a great boxing coach for about the first 6 months of my training career, and then the boxing coach left and the muay thai class became more of an MMA class. My girlfriend and I have always been gym rats, though, so we just kept training each other, spending hours at the gym sparring and doing our own bag and pad work and this basically became how we did things for a while. Getting training from good coaches where we could find it, but mostly being our own 2 woman fight team. We moved states and joined a different gym and started training with a very experienced coach who gave us great training, but turned out to be somewhat unreliable, offered little guidance, and eventually there was a big falling out. We changed gyms again and at this point were fairly jaded with the idea of working with another coach so mainly just did our own thing. After sticking with my current gym for a while I eventually got to know a very good muay thai coach, Phillip Botha, who inspired me to start training with other people again, and I’ve basically stuck with him as my primary kickboxing trainer. Now I’ve also caught the attention of another very good boxing coach who I do personal training with in addition to my kickboxing training. Up to this point, my girlfriend has been my only corner person, save for a few times when other fighters/coaches at the events have volunteered for the job. I do plan on changing this, however, for my future fights.